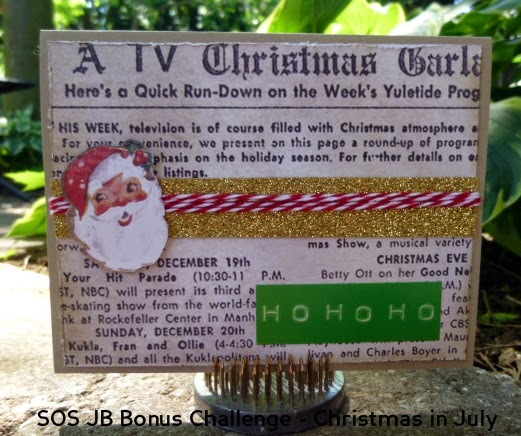 Welcome to week two of the SHOPPING OUR STASH and JINGLE BELLES Christmas in July bonus challenge!! There is something to be said for making Christmas cards in the middle of summer!! Visit both blogs (linked above) for details on the challenge and while you are there show my teammies some crafty Christmas love. So we're going back to December 2012 again for my second card, made from the same card kit that I used for my first card for this challenge - clearly I need to do a better job of actually using my card kits!! The only thing I added this time was the Crumb Cake cardstock and ink (SU) which have both been in my stash for at least a year. From the kit I used Echo Park “Very Merry Christmas” design paper, AC Cardstock gold glitter paper and some more of the maraschino twine. Love the santa and the sketch great use of the baker's twine. Look at that Santa face! How did you not use it before now!? Love the newspaper background, the dymo tape sentiment and the red twine over the gold glitter paper looks awesome! Fabulous card, Donna! This is just darling, Donna! Love the wonderful vintage look to your card and that sweet santa- takes me back to my childhood!